Have fun with Python by coding these Turtle Graphics programs. Are you interested in coding GUI programs in Python? Well, here's a list of my tkinter and AppJar coding tutorials. In the previous tutorial, From tkinter to AppJar (part 2), we converted the file search tkinter app from an earlier tutorial to a shorter 30 line AppJar app. This time we'll take the same file search app and add new code lines to enhance the user interface's look and feel via a series of configuration options. Let's take a closer look at the behaviour introduced by these new code lines. On line 6 we create a splash screen with an appropriate text label. On line 7 we set the background colour of the app window, in this case to orange. On lines 8 and 9 we set the font size of the text labels and the buttons. Notice here the button font size is a little larger than the label font size. Finally, on line 17 we ensure the "Start Path" text entry field is associated with the initial cursor focus. You can find more information on AppJar's extensive widget collection and configuration capabilities at the official AppJar website. In the previous tutorial, From tkinter to AppJar (part 1), we converted a simple tkinter app to a short 8 line AppJar app. This time we'll try out some of the other App Jar widgets by converting a tinter-based file search app from a previous tutorial. As you can see, we've replicated the functionality of the 53 line tkinter file search example with just 30 lines of AppJar code. In part 3 we'll add new code lines to enhance the user interface's look and feel via a series of configuration options. As part of my free Raspberry Pi Python Coding tutorial series I showed how to create Graphical User Interfaces with the tkinter module. However, while it's a very flexible piece of software, writing tkinter apps tends to involve quite a bit of code. 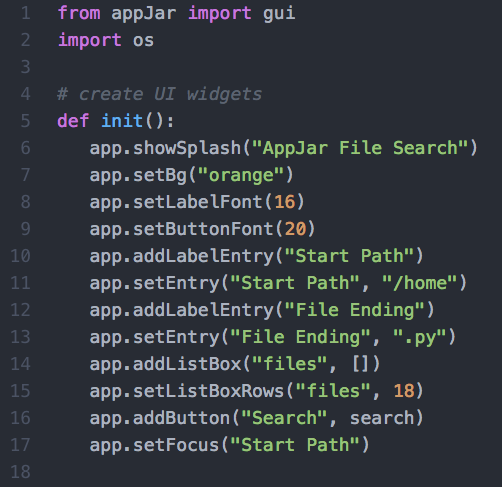 In this post I'll look at a lightweight GUI alternative called AppJar. Although App Jar is based on tkinter, it removes the need for much of the so-called 'boilerplate' code. And this means we can focus our attention on widget-based UI design. First, you'll need to install AppJar. Alternatively, download Appjar, unzip it and move the appjar folder to your source code folder. 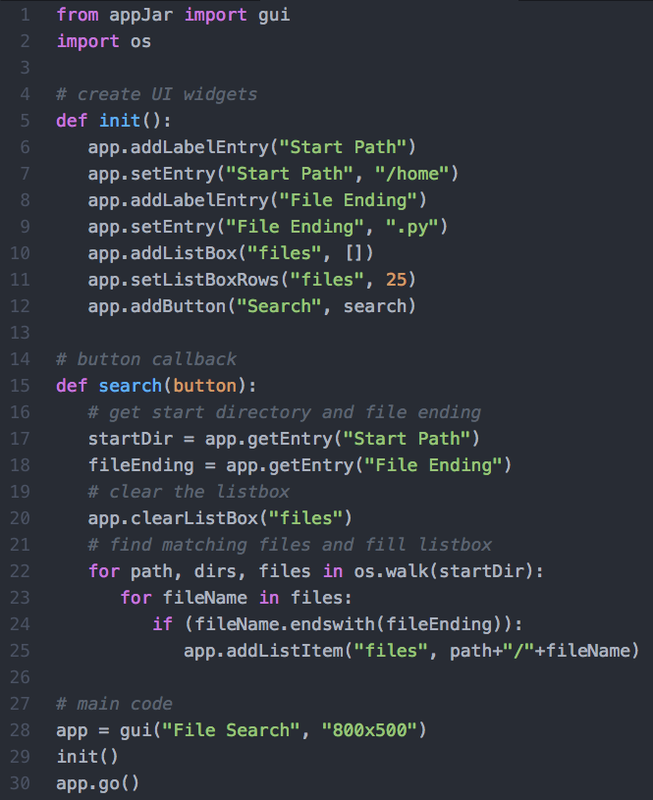 Let's start with an AppJar version of my single button callback tkinter tutorial (which included a detailed walk-through of the code). Notice the size of this program. We've replicated the functionality of the 25 line tkinter example with just 8 lines of AppJar code. In part 2 we'll converting a tinter-based file search app to App Jar. The Java coding language has been included in the Raspberry Pi's official Raspbian distro for some time now. Java 9, the latest incarnation of the language due for release in Autumn 2017, introduces raft of enhancements. In this post I'll touch on some Pi-centric key aspects of Java 9, namely the new Java Shell, modularity and jlink, plus CPU support. Python has always had a read-eval-print loop (REPL) command-line option. It's a great way for newbies to get to grips with the coding basics and the language syntax. Until now Java hasn't had a REPL option. But version 9 comes with jshell. Key features are: instant feedback, optional semicolons, a range of pre-imported libraries (like io, math, net and util) and a handy collection of slash commands to load, save, manipulate and analyse source code. You can experiment with shell now in the Java 9 early release. As your Java project grows the number of libraries and their dependencies starts to get increasing complex. This can mean your programs are slower to load and execute. Project Jigsaw set about changing this picture by breaking things up into a collection combinable blocks for system, jdk, source code and binary runtime elements. This work lead to Java 9's new requires keyword, which helps to identify library dependencies. When compiling a runtime image this information is used by 'jlink' to assemble and size-optimize a binary runtime image. Java 9 takes advantage specific CPU instruction sets commonly found in modern 64-bit processors, like the ARM v7/8 CPUs and x86 range. This move will help improve runtime performance. However, as of today, this does limit Java 9 to the Raspberry Pi 2 and Pi 3 boards. Owners of model As, Bs and Zeros, with their older ARM v6 processor chips, will therefore have to keep using Java 8. 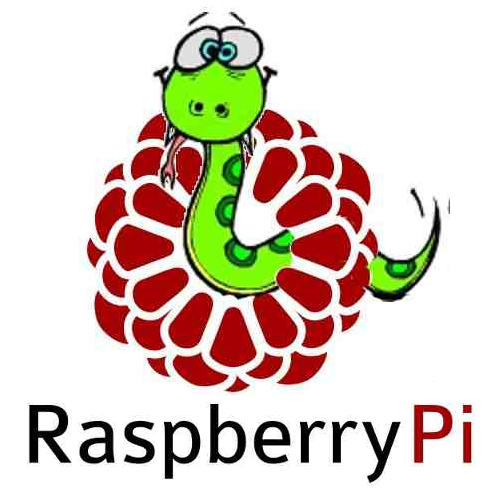 Python coders who use the latest Raspberry Pi Raspbian Pixel distro will find the Thonny Python REPL development tool is pre-installed. Thonny is a far better development option option than IDLE or many other Python editors. 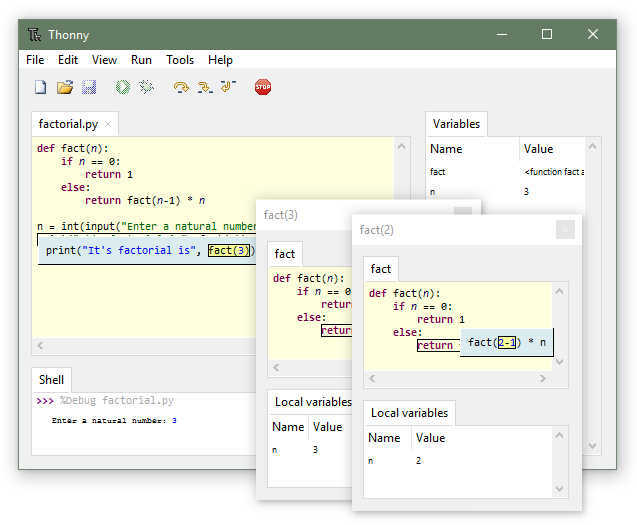 Thonny comes with Python 3.6 built-in, has many pro-level features, yet retains an easy-to-use user interface. Sound interesting? Then head over to the Thonny.org webpage where you'll find additional information, a Thonny in action video demo, plus download instructions for older Raspbian distro releases or Windows, macOS and Linux. And there's more helpful information in an online MagPi Thonny tutorial. Previously we had a look at creating Graphical User Interfaces with Tkinter as part of my free Raspberry Pi Python Coding tutorial series. Tkinter is certainly a very flexible piece of software, capable of implementing all kinds of user interface (UX) designs. However, the lines of code needed to create usable solutions tends to rise quite quickly. This can make things a little difficult for those with relatively limited Python coding experience. Recently a couple of Tkinter-based Python modules have started to address this issue. One is GuiZero and the other is AppJar. The idea behind these modules is to simplify the creation of grid-styled form-based apps, while still supporting a wide variety of widgets. Both are easy to install and use. Although be aware that as they are still in development sfeatures are subject to change and you may encounter the occasional bug. AppJar documentation is based around a 'code sandwich' metaphor with a menu of widget-based fillings. Code examples include Minecraft interaction and there's also a series of hands-on AppJar coding tutorials. The GuiZero documentation is also straightforward to follow with plenty of code examples, such as how to use the multi-cell Waffle grid layout. Here are details of the Sushi-style cards I created for the CoderDojo organisation. 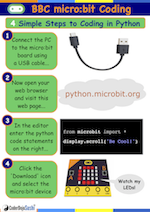 Two ways to start MicroPython coding with your USB-connected micro:bit board. • Quickest - point your web browser to the official MicroPython coding website. • Most Flexible - download the free Mu MicroPython Editor, which is available for Windows, macOS, Linux and the Raspberry Pi. MicroPython code examples covering the LED display, the A/B buttons, plus the temperature, magnetometer and accelerometer sensors. This time we'll take advantage of the micro:bit's magnetometer sensor (which detects magnetic fields) to build a North-finding compass app. Note that the magnetometer needs to be calibrated before we use it. This is done by tipping the micro:bit around to draw a circle on the LEDs. Be aware that sometimes the magnetometer calibration can be affected by the magnetic fields emanating from an electronic device, such as a computer. As a coding challenge you could try to add compass directions for South, East and West. This time we'll create a spirit level that uses x-axis data from the micro:bit's built-in accelerometer sensor. The micro:bit's accelerometer is sensitive to the slightest movement. In fact, it is too sensitive for our purposes. So here we take the returned accelerometer x value and divide it by 20 using the integer divide // symbol. For a simple coding challenge try changing the integer division value from twenty to something smaller or larger, then discover how much harder or easier it is keep level. A more advanced coding challenge would be to create a dual axis spirit level using both the get_x() and get_y() accelerometer functions. 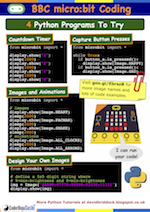 Return to the BBC micro:bit MicroPython Coding Tutorials page. 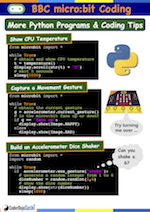 In this tutorial we'll take advantage of the 'shake' accelerometer gesture to build a dice shaker, which can be used to play all kinds of games. Notice here we import the random MicroPython library module as well as the standard microbit library module. After you've downloaded this program to the micro:bit try to shake a six! As a extra coding challenge you could modify the code to simulate two dice (hint: the minimum throw is 2 and the maximum is 12). This time we'll capture movement gestures, as recognised by the micro:bit's built-in accelerometer sensor. # is the micro:bit face up or face down? Once again we indent the main code inside a While True: endless loop so the program can continuously test for gesture changes. After you've downloaded and run this program on the micro:bit modify the code to discover other recognised gestures, such as: 'up', 'down', 'left', 'right', 'freefall' and 'shake'. In this example we obtain the temperature of the micro:bit processor, which rises quite quickly after it is powered on. Once again we indent the main code inside a While True: endless loop. 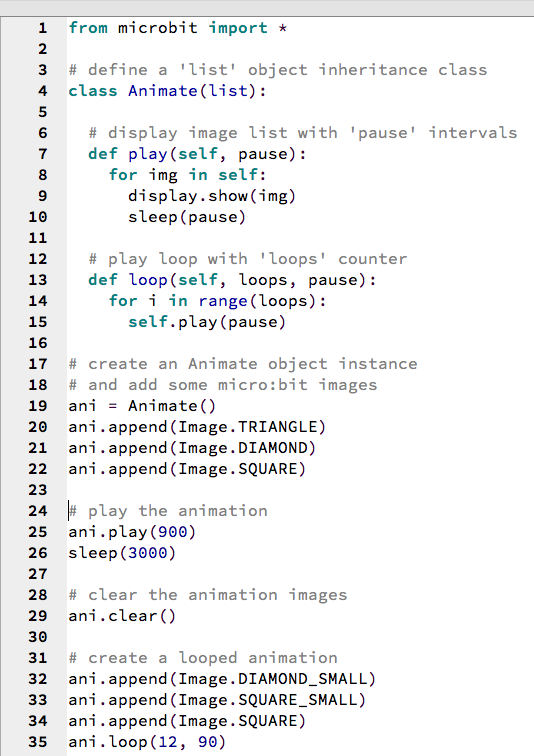 However, this time there's a five second delay between each loop iteration. Notice that we also use the str() function to convert the integer temperature value in the variable t into a string. Leaving it as an integer will result in an error condition when the program runs. To see the temperature rise disconnect the micro:bit for a while, so it can cool down, then reconnect to downloaded and run the program. Next try modifying the code to display the temperature in Kelvin (hint: 0 Celsius is 273 Kelvin). 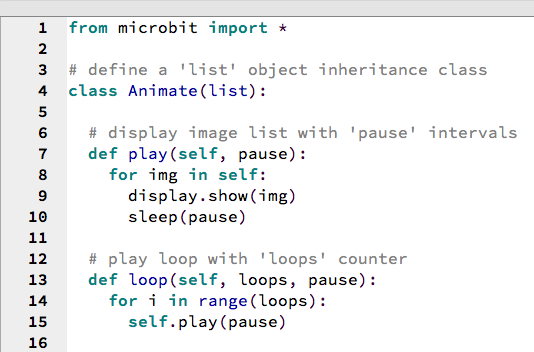 Sometimes the pre-defined MicroPython images don't cover what we need. The micro:bit's 25 pixel LED display is arranged as a five row and five column grid. We can create our own image by setting an LED brightness value for each LED. A value of 9 represents the maximum brightness while a value of 0 switches the LED off. The image defined by a long string of digits. This string is divided up into five sections, separated by a colon (:) character, with the first section representing the top LED row. And each section contains five digits, with the first digit corresponding to the first column. After you've downloaded and run this program on the micro:bit modify the string to display your own LED images. It's a good idea to sketch out the pattern designs on paper first using a simple 5x5 grid pattern. Here's how to display images and image animations on the LEDs. After you've downloaded and run this program on the micro:bit try out these other image names: SMILE, SAD, CONFUSED, ANGRY, ASLEEP, SURPRISED, SILLY, FABULOUS, MEH, YES, NO, TRIANGLE, TRIANGLE_LEFT, CHESSBOARD, DIAMOND, SQUARE, RABBIT, COW, MUSIC_CROTCHET, MUSIC_QUAVER, MUSIC_QUAVERS, PITCHFORK, XMAS, TARGET, TSHIRT, ROLLERSKATE, DUCK, HOUSE, TORTOISE, BUTTERFLY, STICKFIGURE, GHOST, SWORD, GIRAFFE, SKULL, UMBRELLA, SNAKE. This little program display a different image when the 'A' and 'B' buttons are pressed. Here we use a While True: statement which create an endless loop. Make sure you use the correct indentation levels for the code inside the loop and inside the 'if' test statements to avoid errors when the program runs. After you've downloaded and run this program on the micro:bit try changing the image names for the A and B buttons. Type in the following code to create a three second timer. Notice we put quotes around the countdown numbers so they appear as strings to the display.show() function. After you've downloaded and run this program on the micro:bit have a go at building a 10 second timer. Mu is a free BBC micro:bit code editor, written in Python 3, designed to run on Microsoft Windows, Apple Mac and Linux computers or the popular Raspberry Pi. Mu has built-in support for the MicroPython language. It can flash programs to the micro:bit with a single click. And it has a special panel to help locate and fix coding errors. 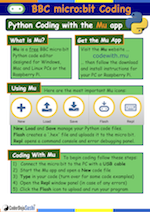 Visit the Mu website codewith.mu, then follow the download and install instructions for your PC or Raspberry Pi. New, Load and Save manage your Python code files. Flash creates a '.hex' file and uploads it to the micro:bit. Repl opens a command console and error debugging panel. Carefully enter these two lines of Python code into Mu, then click the Flash icon to transfer it to the micro:bit device. After watching the message scroll across the LED display try replacing 'Hello!' with your own message, remembering to put it inside the quotes (''). Connect your PC or Raspberry Pi to the micro:bit board with the USB cable. Using a web browser navigate to the python.microbit.org website. Finally, click the 'Download' icon, select the micro:bit device and watch the message scroll LED display. Try replacing 'Hello!' with your own message, remembering to put it inside the quotes (''). The micro:bit is a small embedded system designed to help schools teach coding and other constructional thinking activities. Despite its diminutive size the board is loaded with features. The most obvious are the 5x5 LED matrix display and the two push buttons. However, there's also temperature, accelerometer and magnetometer sensors, both radio and bluetooth wireless communication, plus an array of digital and analog I/O pins that interface connect the micro:bit to electronic circuits, additional sensors, robotic kits and other gadgets. The Raspberry Pi is a low cost educational computing platform specifically aimed at hardware and software experimentation. Starting at around £4 for the Pi Zero to around £30 for the powerful Raspberry Pi 3 it's an ideal product for anyone with a desire to learn the craft of software programming and explore the powerful Linux operating system. This interactive tutorial is based around my multi-part Micro Mart magazine series Learn Python on the Raspberry Pi. Learn Python by experimentation, typing in the fully documented code to discover how to program useful, educational and entertaining apps. After each topic you'll know a little more about the Python coding and the art of programming. The Python code runs on all Raspberry Pi boards; Pi Zero, Model A, Model B, Model A+, Model B+, Pi 2 and the Pi 3 (and should also run on Windows, Mac OS X and Linux). 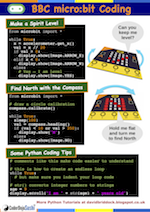 Start coding in Python with my free in-depth Learn Python on the Raspberry Pi series of posts. Use Python code to explore the downloadable Astro Pi CSV data from Tim Peake's ISS mission and create a Python Date Filter. Build your own Astro Pi computer using a Raspberry Pi 2 or 3 and a Sense HAT. Learn the Java programming language with tools like BlueJ (maybe using the BlueJ Learning Videos), or the Greenfoot IDE or Dr Java. Customise the hackable Raspberry Pi Minecraft edition using Python code or with Java using BlueJ.